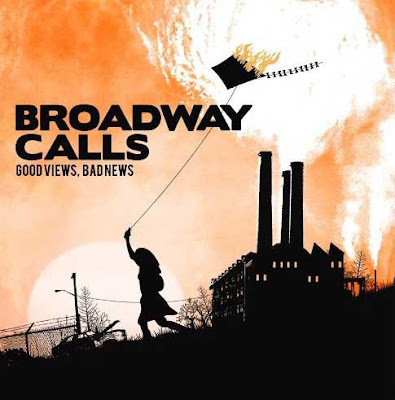 When Broadway Calls entered general consciousness a year or so ago, their back-to-basics approach to punk rock grabbed the attention of the critics and the public alike. “Good Views, Bad News’ only stands to win them more affection – quite simply, it’s an absolute blinder of a record. The one quality that made Broadway Calls stand out in the first place, is their brilliant mix of punk rock energy, lyrical depth and massive, massive hooks. This time around, they’ve improved that formula ten-fold, from the epic chorus of ‘Midnight Hour’ to the thought-provoking lyrics that narrate this album, everything has been tightened up, polished with a damp cloth and cranked up a gear. What excites me most about this record though, is how it’s going to sound live. Listen to the gang vocals of ‘To The Sheets’ and chorus hook of ‘Be All You Can’t Be’ - these songs are going to sound phenomenal with a crowd backing them. They’re going to rip the roof off the Radio 1 Stage at Reading and Leeds in a few weeks time.